I prefer to work from one photograph in particular; however, you can send me several to get an idea of your pet. However, please make sure the photograph(s) is/are a clear representation of your pet. The higher the quality photograph, the better! I may not be able to work from blurred or very small photographs. I can accept real photographs by post (these will be returned with your commissioned piece), by email (preferred) or by a CD sent in the post. · Photograph your pet outside (or if that’s not possible, in a room well-lit with natural light). Relying on a camera’s flash can severely affect fur colour and cause strange coloured eyes. · Take lots of photographs and choose the best few at the end. · Get down to your pet’s level rather than looking down at them. There are more tips for photographing your pets on Digital Photography School’s website. 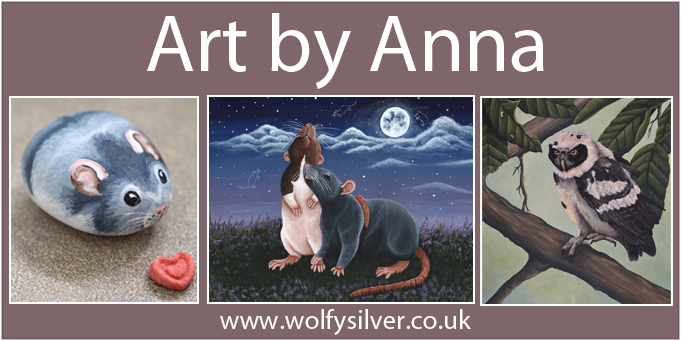 I work in a variety of sizes and mediums, please look at the sections on my website to see examples. Typically paper sizes around A5 are only suitable for portraits (not full-body pictures) apart from in the case of very small pets like rodents). For acrylic painted pieces I can work on canvas textured paper (suitable for framing), canvas panel (canvas with a hard backing) or stretched canvas (usually hangs as it is without the need for framing). I have listed paper sizes I typically have available at anytime. However, if you would like a size not listed please contact me and I can find out a price for you. After receiving the photograph(s) I will prepare a rough initial sketch. The client will then be shown the sketch and decide if the picture/concept is progressing as they imagined. I will then carry on, or adjust the picture as needed. For large, detailed portraits (such as those with backgrounds) I will send email progress pictures if requested to make sure the picture is progressing as the client had in mind. Detailed Backgrounds come at extra cost - however, if you wanted just a simple colour background this is at no additional cost. I also offer stretched canvas (can be framed as-is) and canvas panel commissions. Please email me with what size you are looking for and I can give you a quote. Pictures can be collected for free from me directly. I am located in the Herefordshire area. If you are interested in a custom painted wooden box please contact me directly as prices depend on box size/level of detail required. I take payment through cheque, Paypal or in person (only available to those collecting the piece themselves). Please contact me in regard to any other medium, such as watercolour, or for different paper sizes than mentioned. If you have any questions or would like to commission me, please email me.